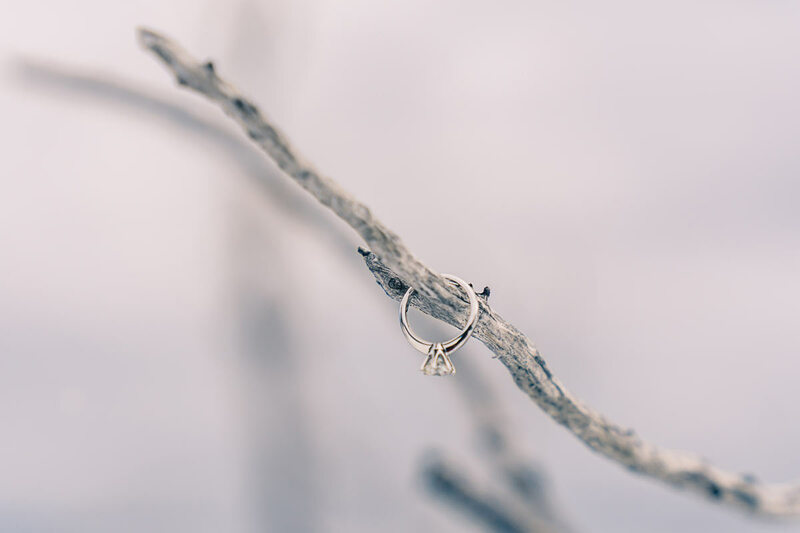 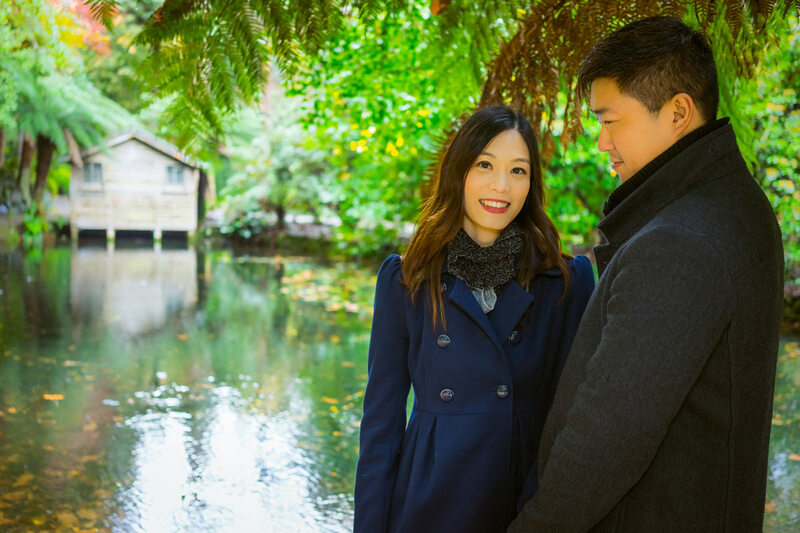 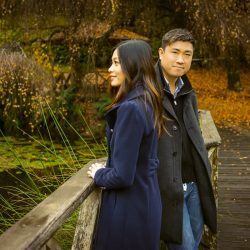 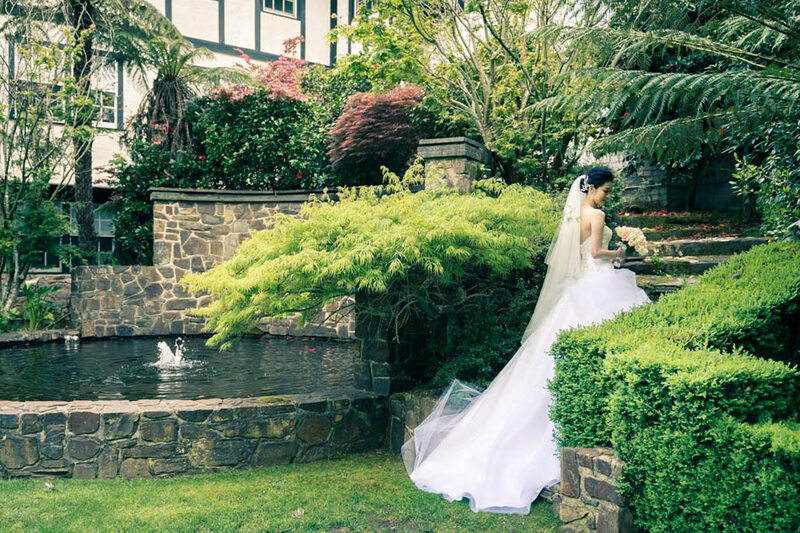 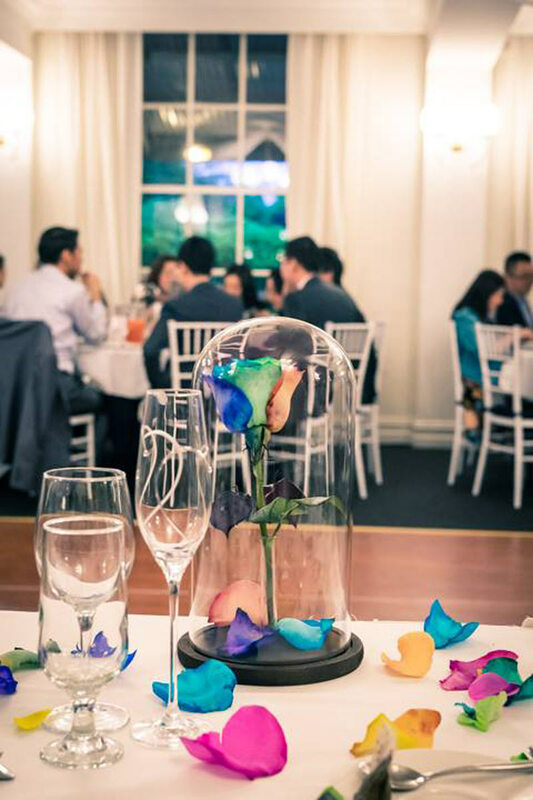 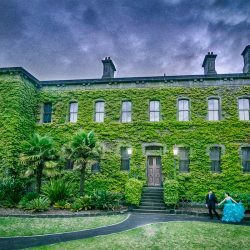 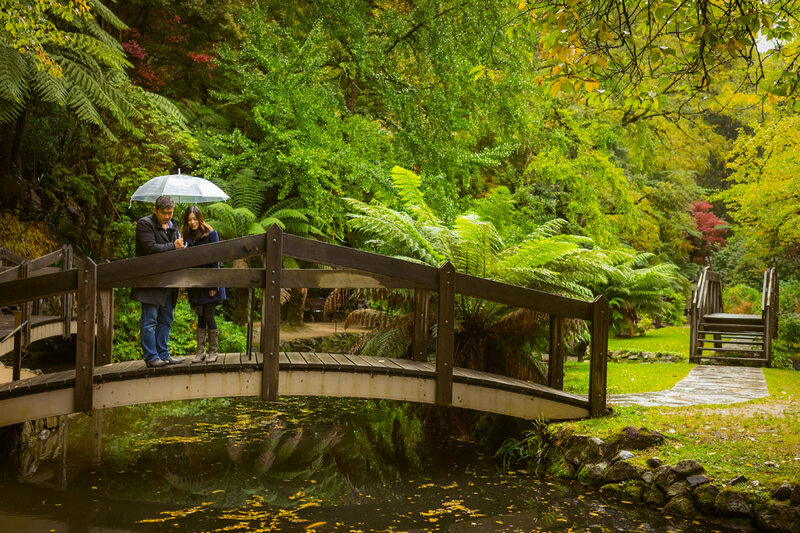 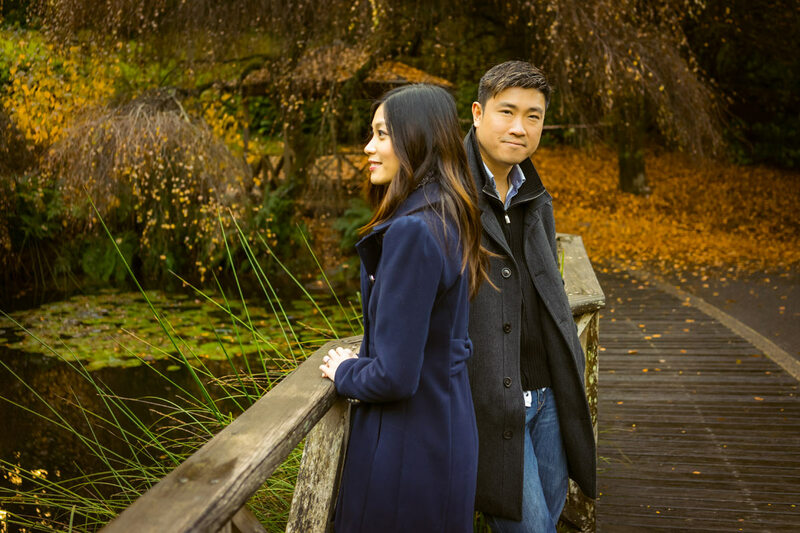 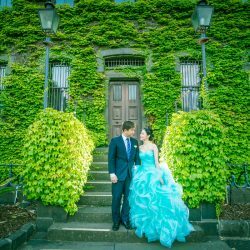 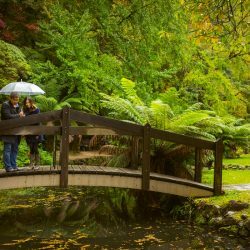 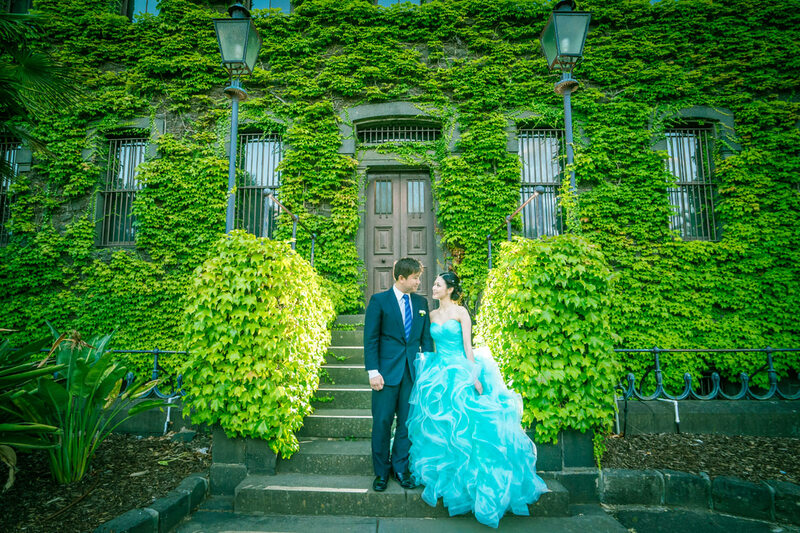 Melbourne couple takes four seasons theme engagement photos before their Marybrooke Manor wedding with stunning results! 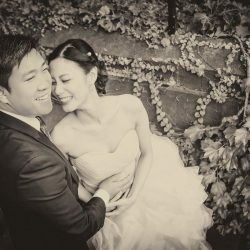 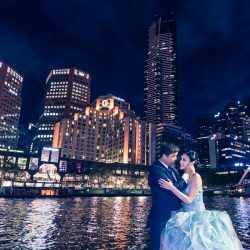 Pre-wedding photography (engagement photography) has been very popular in Asian countries for almost two decades. 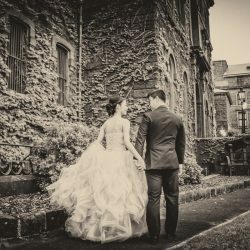 Some couples even take their pre-wedding photos before they get engaged, almost like a ‘couple’s photography’, but dressed in beautiful wedding gowns and suits. 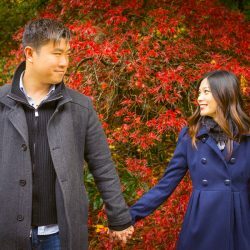 Some couples even take their engagement photos before setting a wedding date! 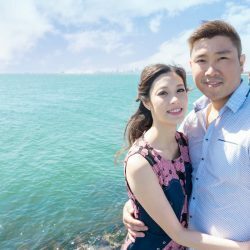 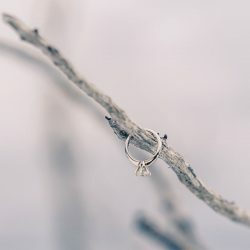 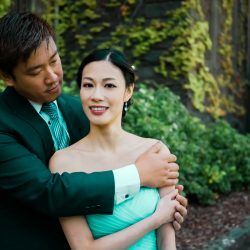 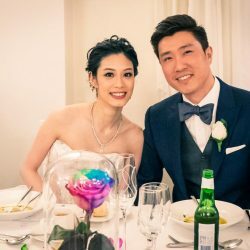 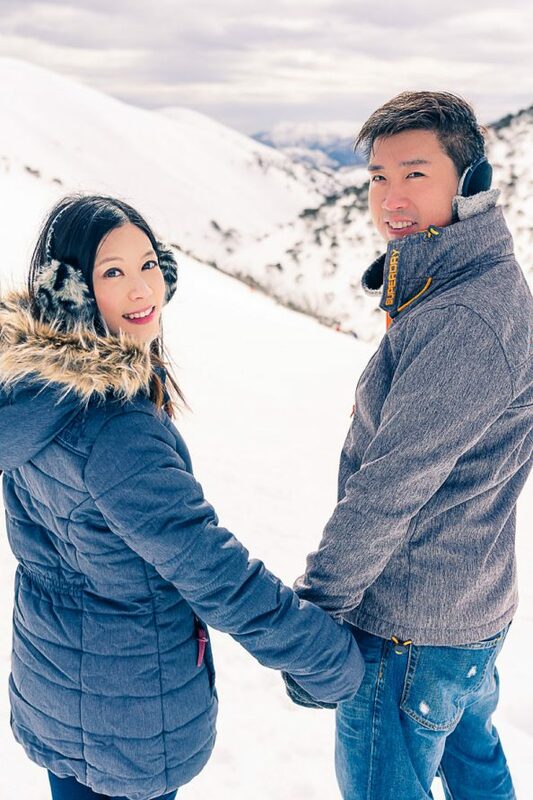 Derby and Yu Sze got engaged in 2016. 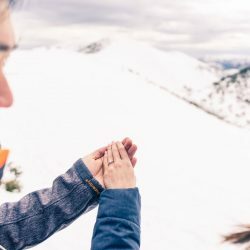 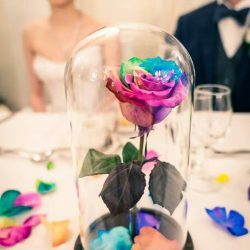 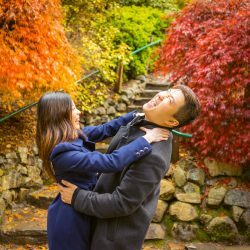 They contacted Black Avenue Productions and asked if they could take their pre-wedding photos over four seasons, to capture their love throughout the year instead of over one day. 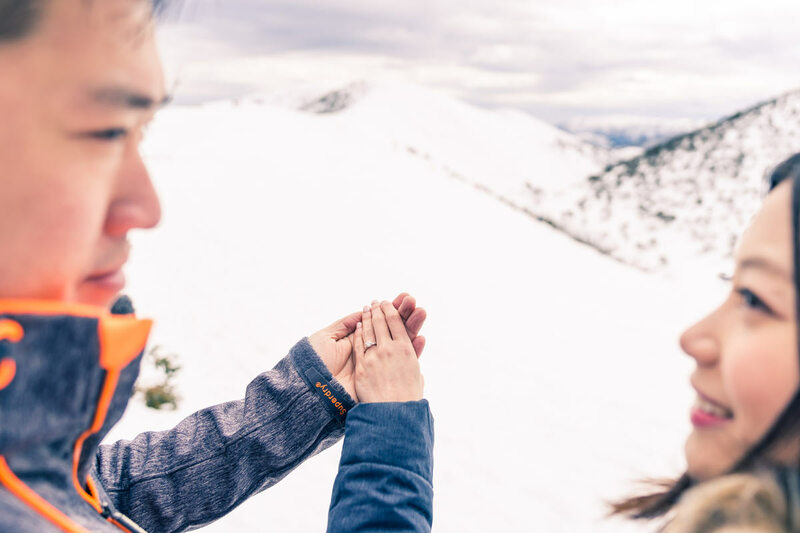 Naturally we love a challenge, so we said YES! 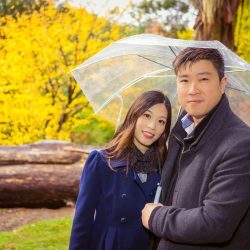 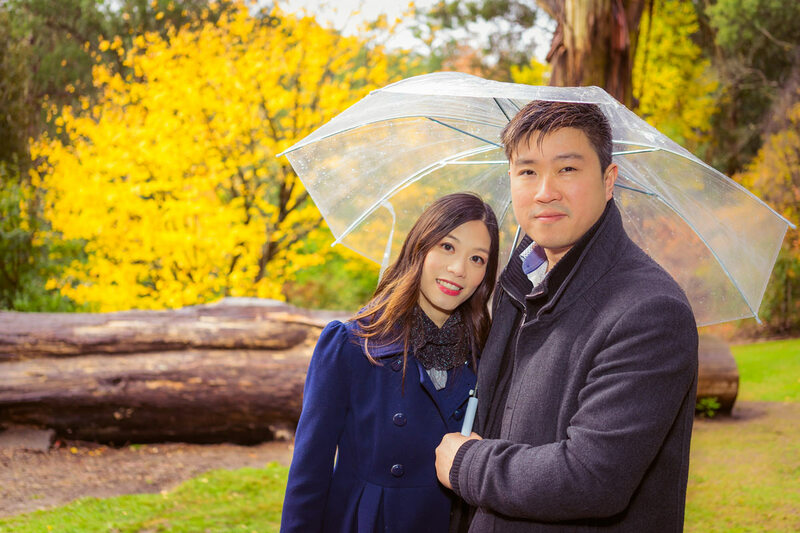 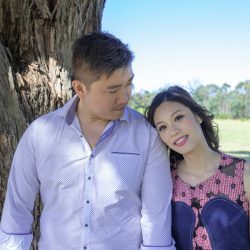 With flowers starting to blossom and the tree’s leaves coming back after winter, Melbourne’s Spring was looking beautiful as we met-up with Derby and Yu Sze to take their first season’s photos. 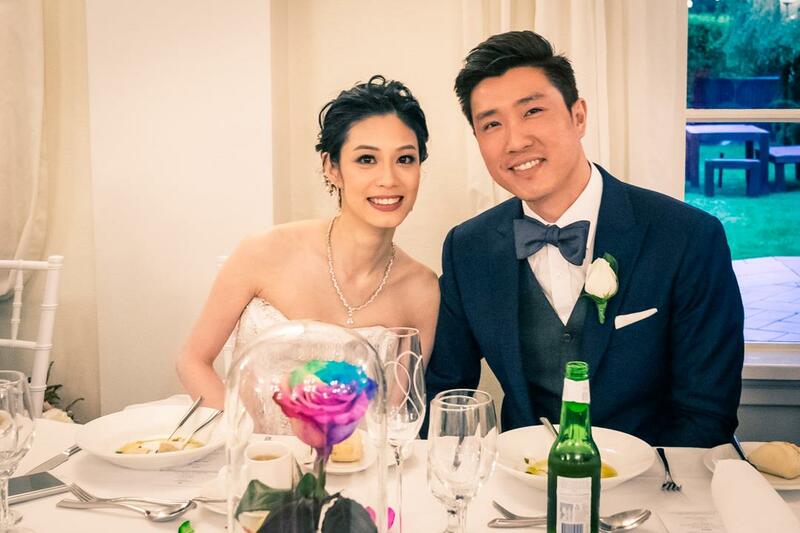 Derby looked enchanting next to Yu Sze who wore a smart looking tailored navy blue suit. 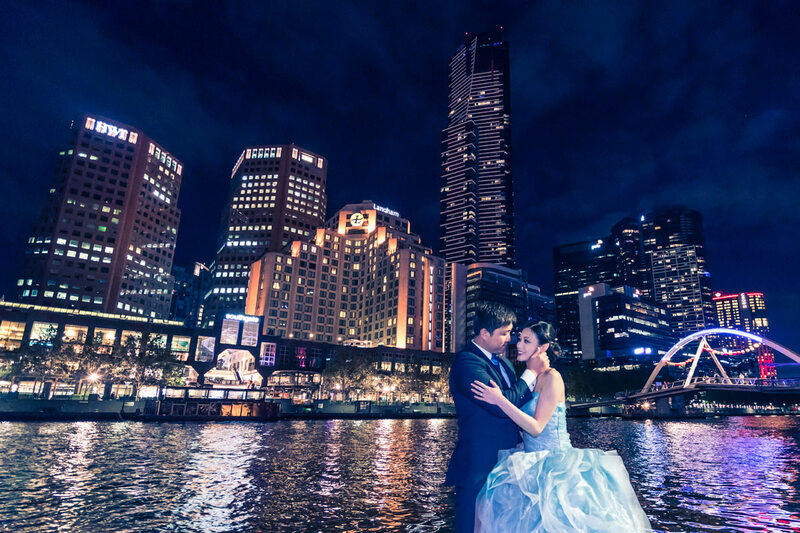 Derby’s hair and makeup was done by Black Avenue Productions and the locations chosen around Melbourne included the Victoria Barracks, Flinders Street station and night view from the Yarra river in Southbank. 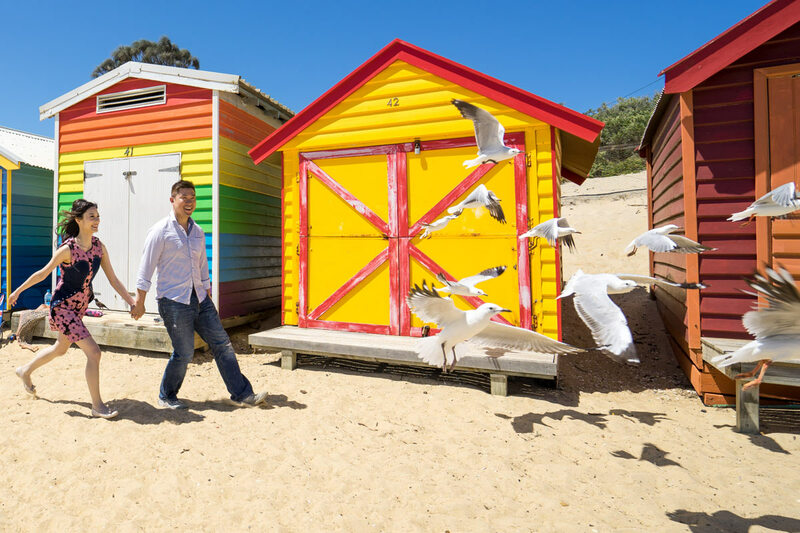 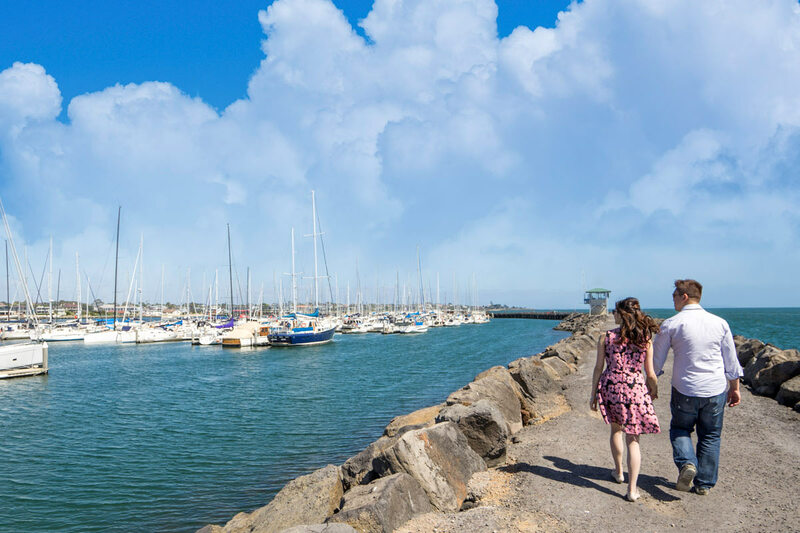 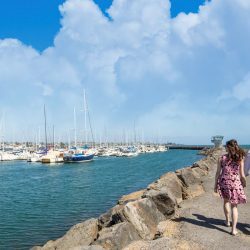 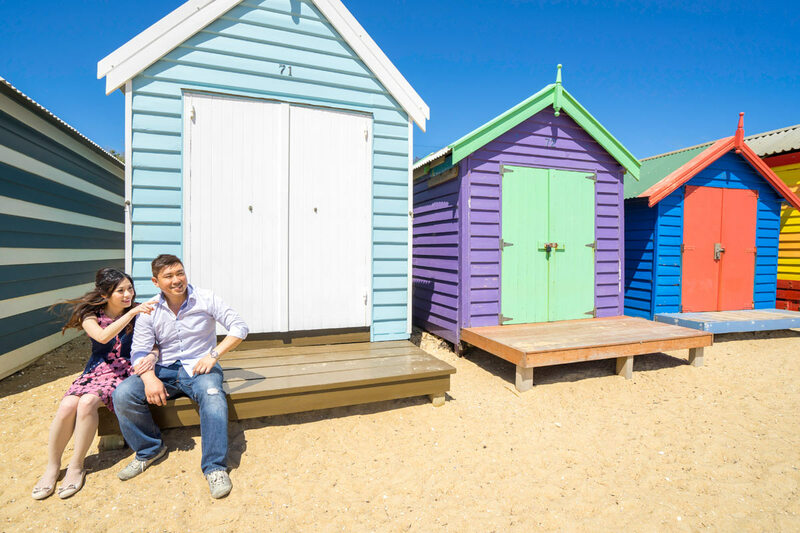 Taking a more casual approach to the couple’s summer shoot, we headed down to Brighton to capture some romantic moments amongst Melbourne’s beach life. 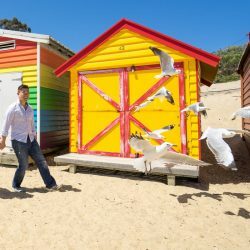 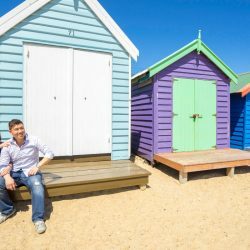 Brighton’s famous beach houses never fail in making an impressive backdrop to beautiful photos and the weather was perfect. 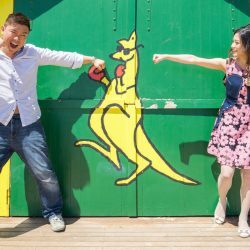 We were pleased to capture Derby and Yu Sze’s casual side and have a little fun with their photos for the summer season. 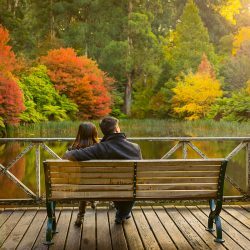 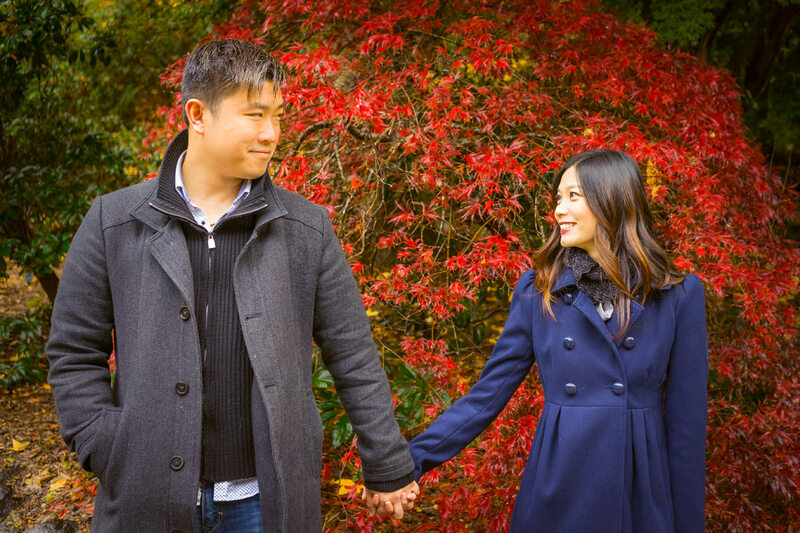 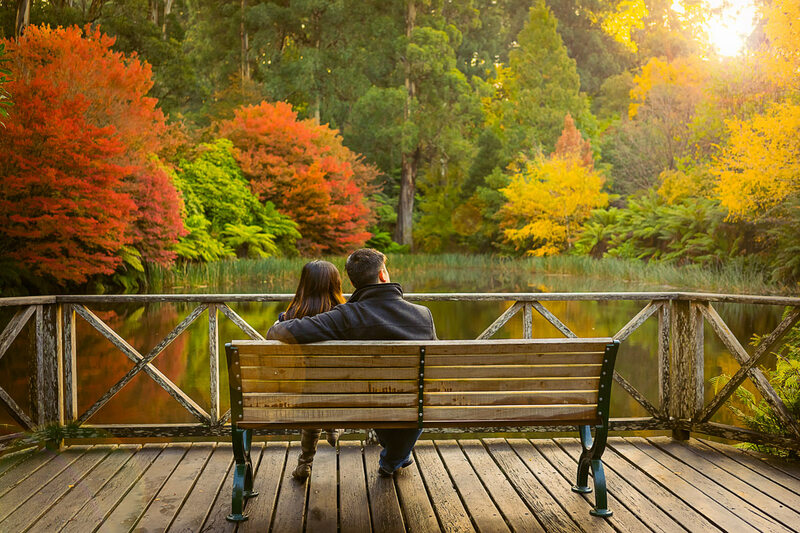 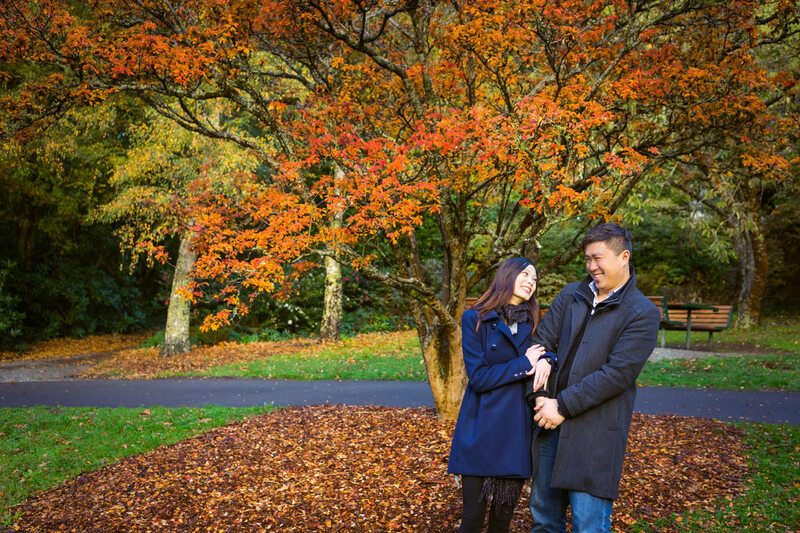 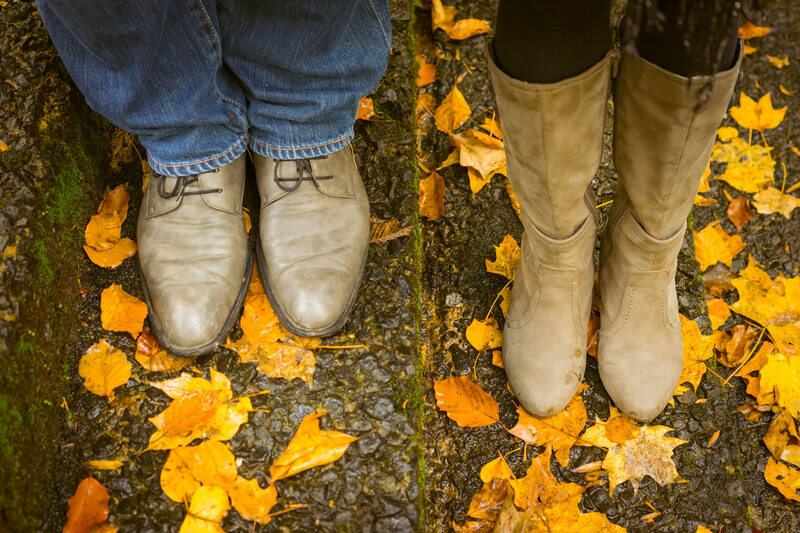 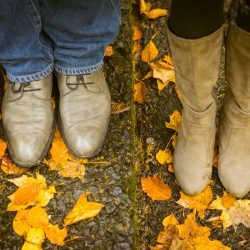 Autumn leaves in orange and yellow proved to be a successful backdrop for the couple’s autumn season shoot in the Mt Dandenong Ranges. 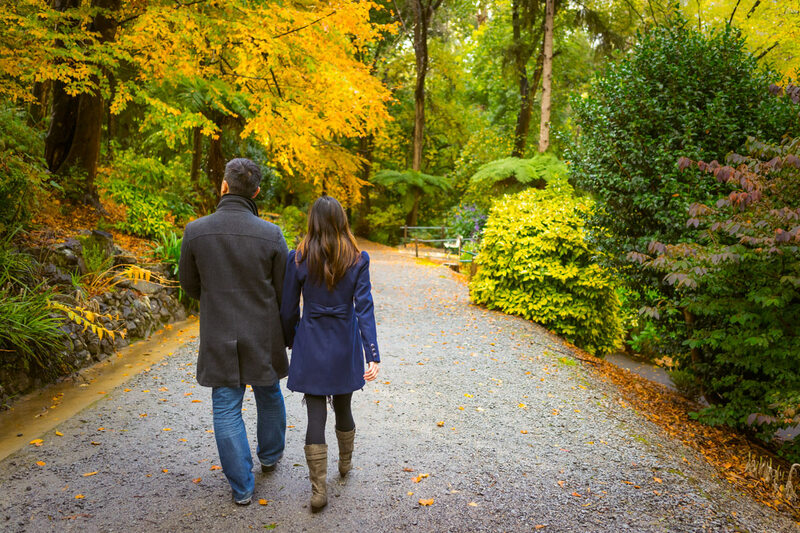 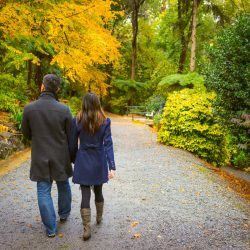 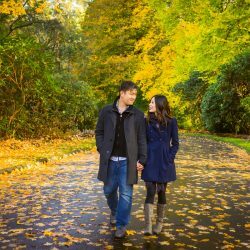 What better way to capture a couple’s romantic walk in a park? 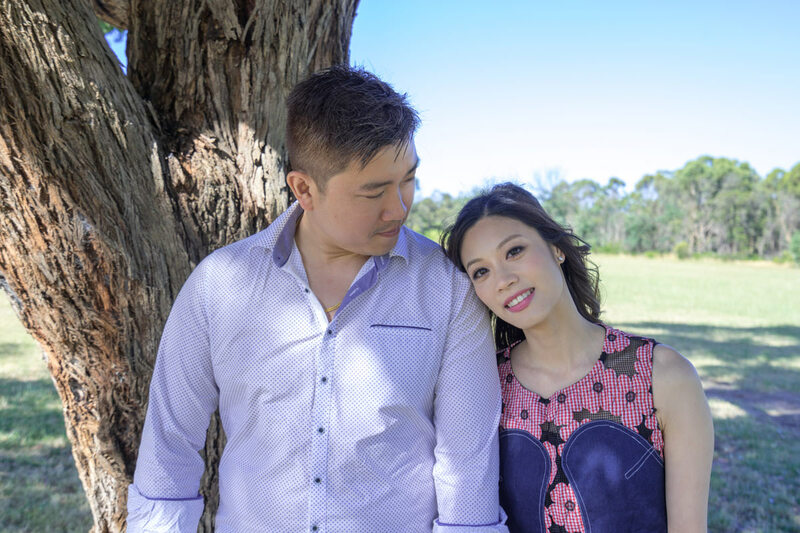 Derby and Yu Sze wore casual winter wear attire, which contrasted beautifully with the bright colours surrounding them. 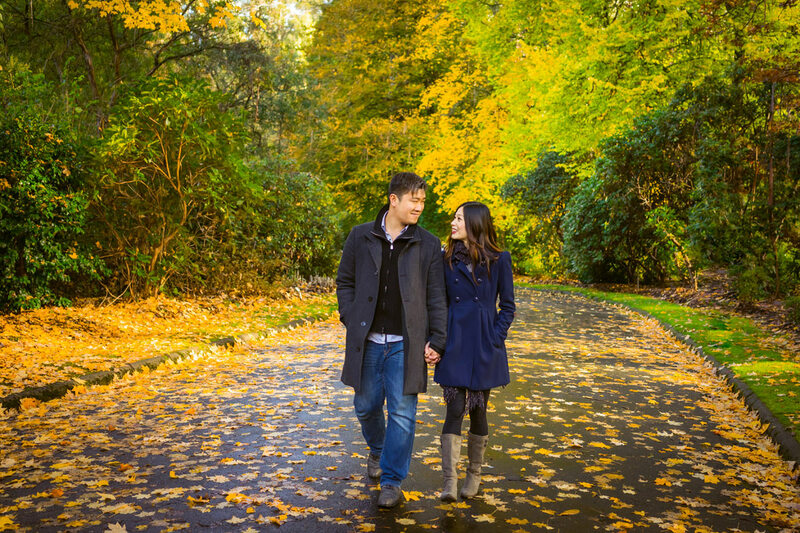 Some how Autumn never fails when needing a beautiful romantic backdrop. 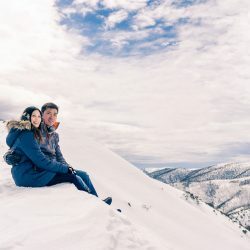 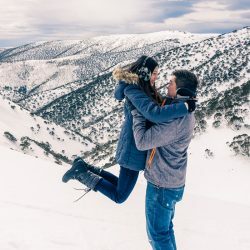 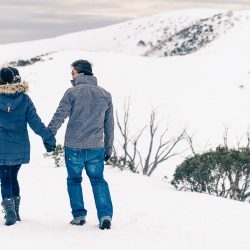 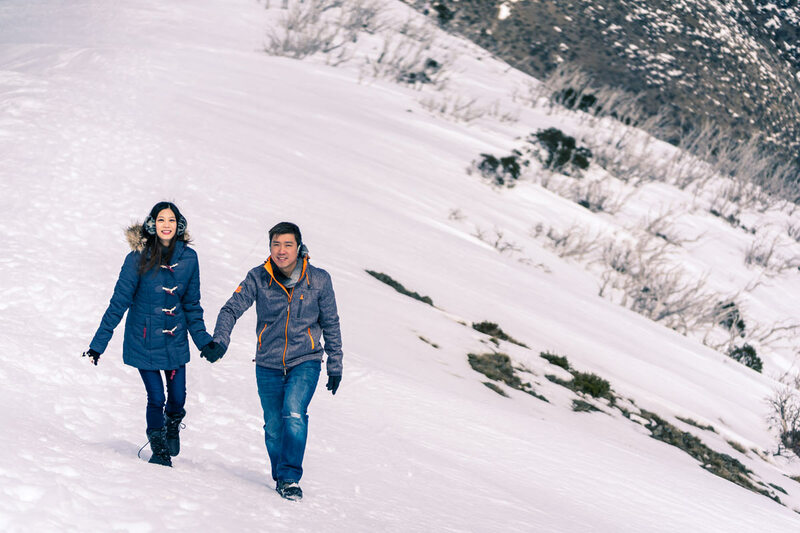 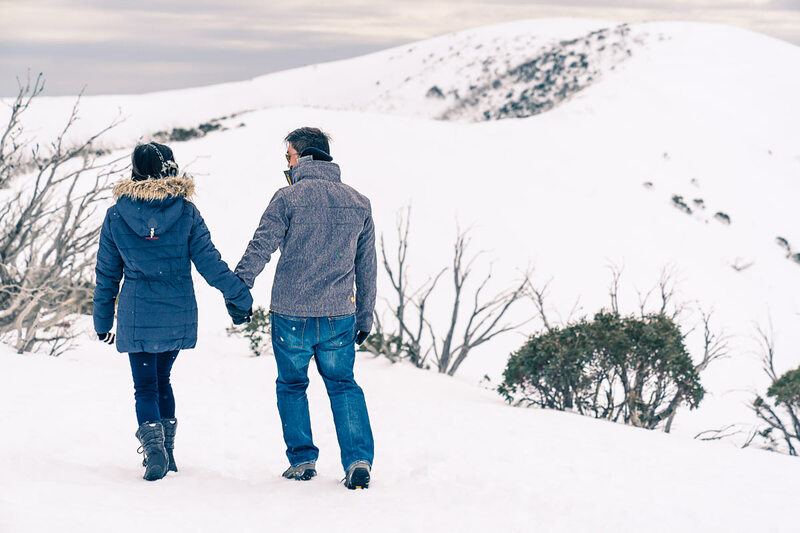 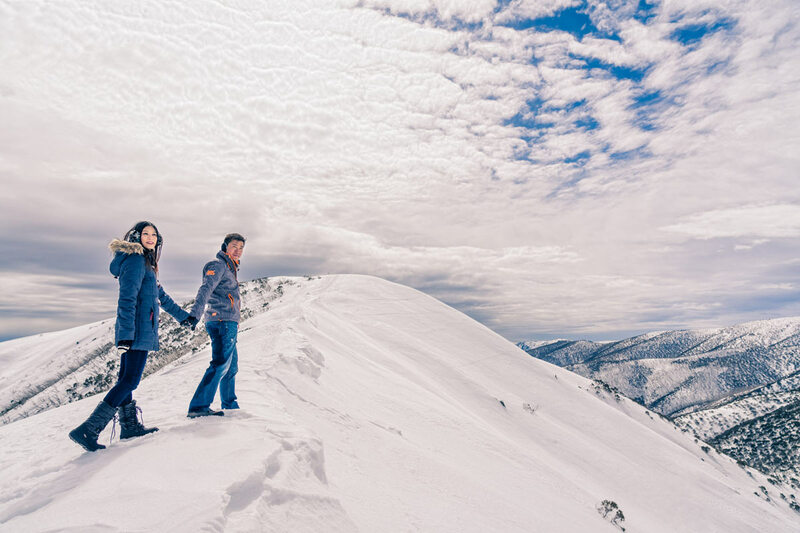 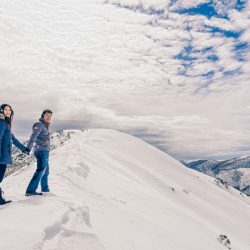 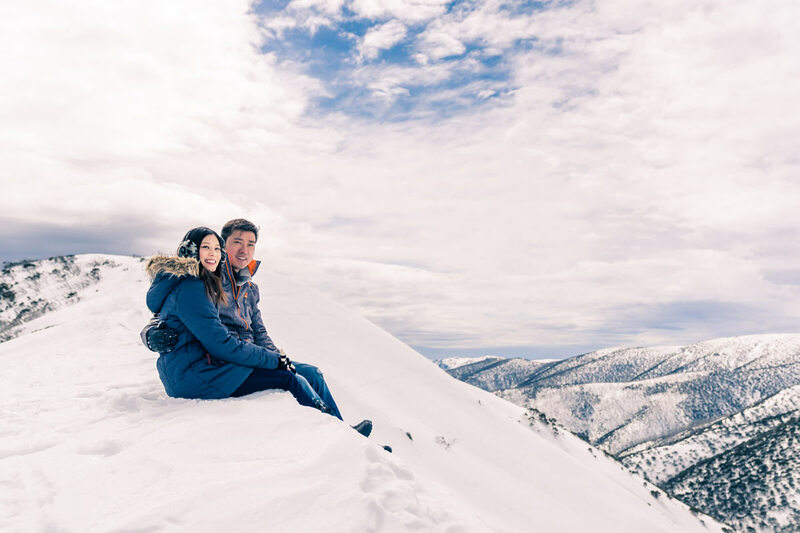 Derby and Yu Sze went all out for their winter season shoot at Falls Creek. 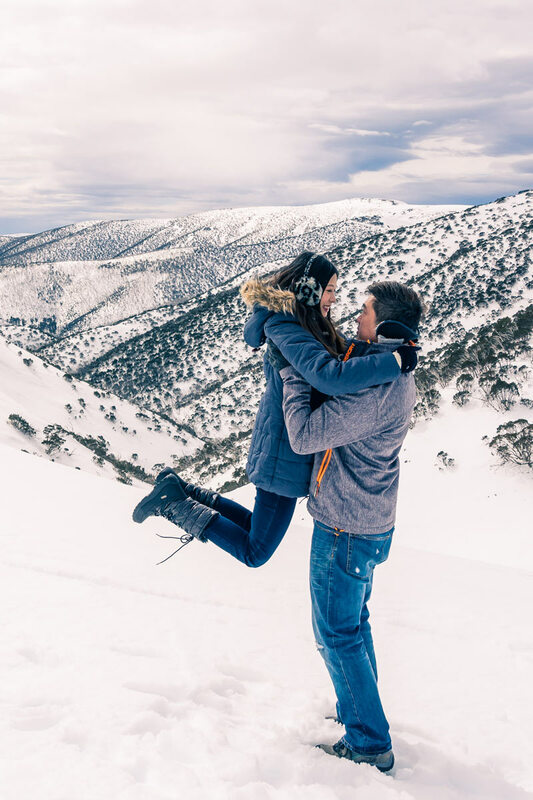 The end result was stunning snow filled mountains and picturesque backdrops to complement their romantic photos. 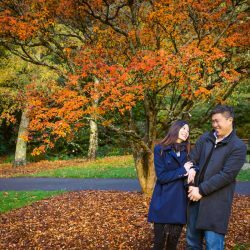 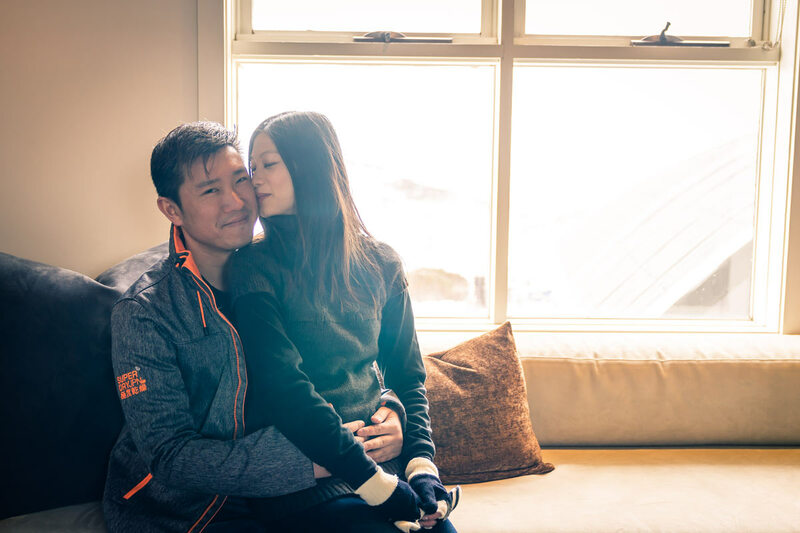 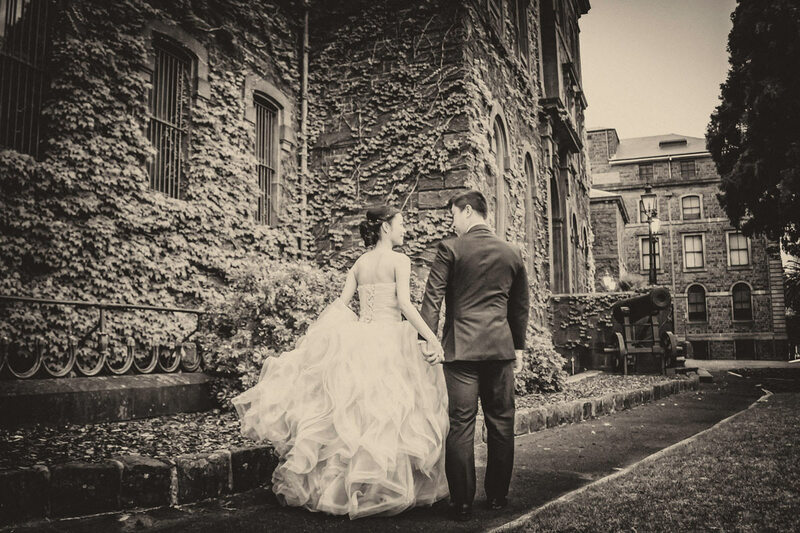 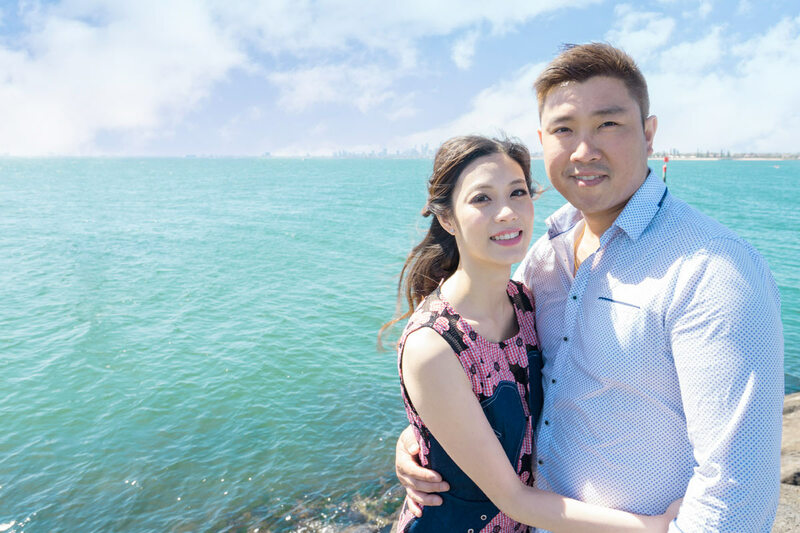 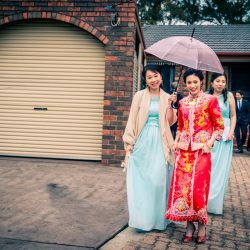 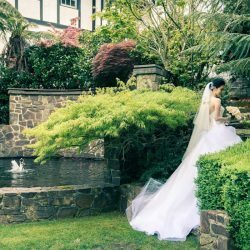 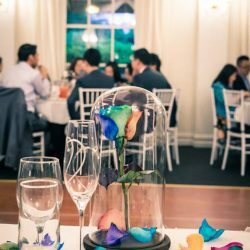 When the big day finally came, Derby and Yu Sze were thrilled to show their family and friends their stunning pre-wedding photos at their wedding with extremely positive feedback. 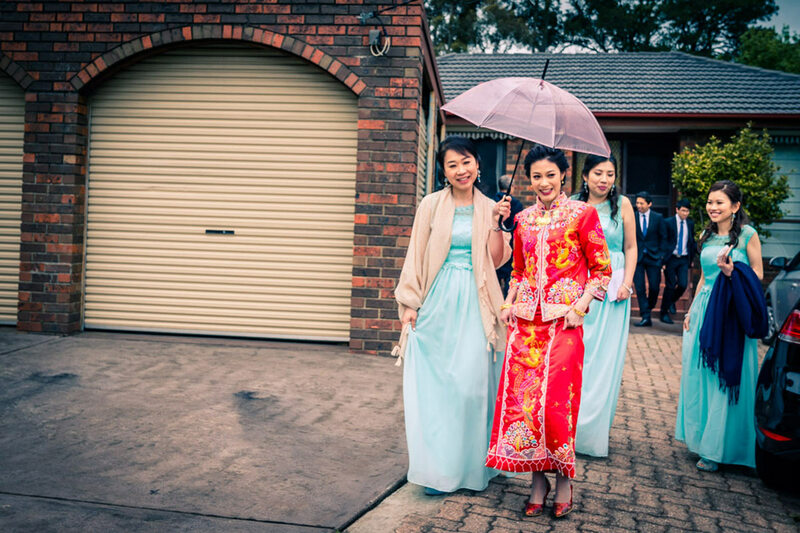 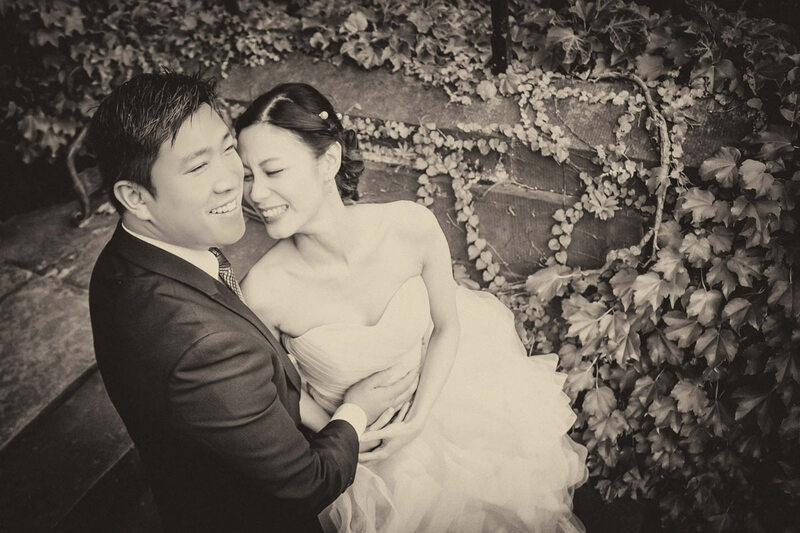 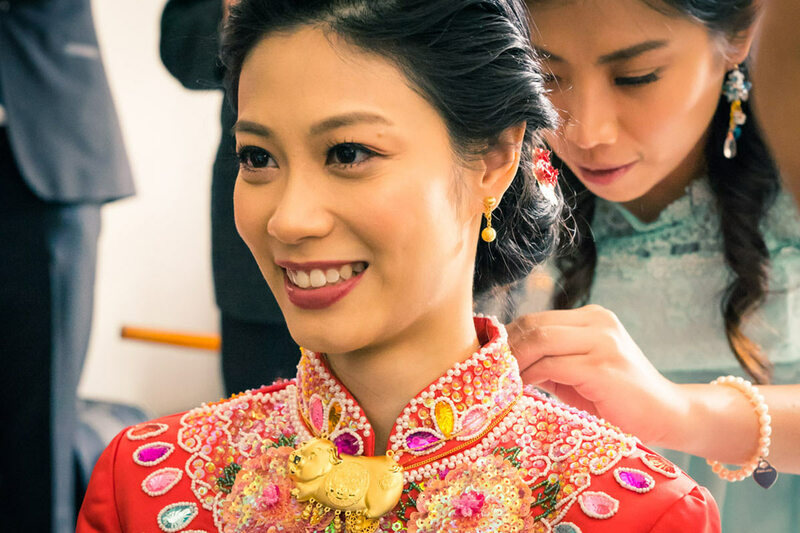 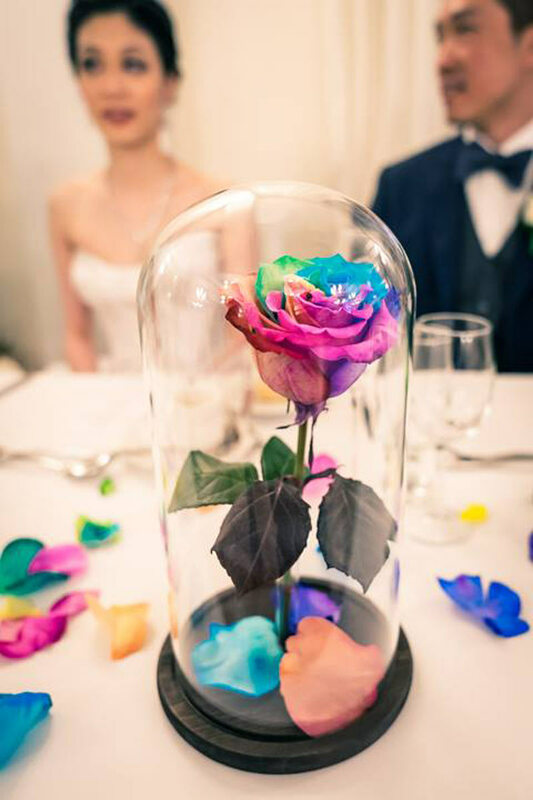 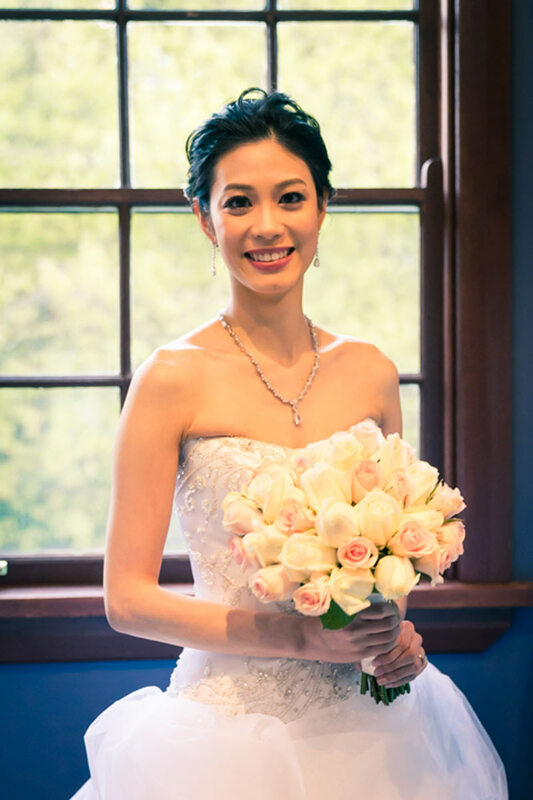 Held in this stunning venue Marybrooke Manor and incorporating a Beaty and the Beast theme, Derby wore a traditional Chinese wedding dress for their ceremony and Yu Sze looked smart in his slick formal suit. 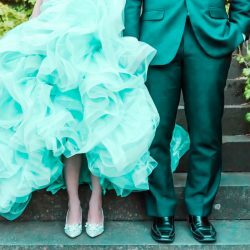 Derby later changed into her aqua wedding dress, which impressed all the guests at the reception. 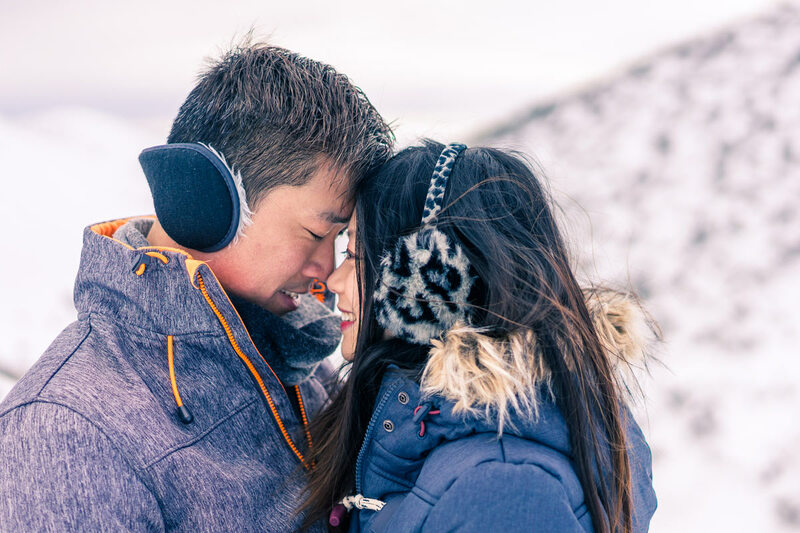 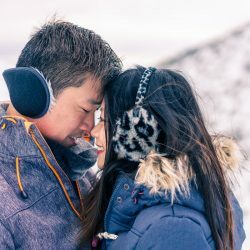 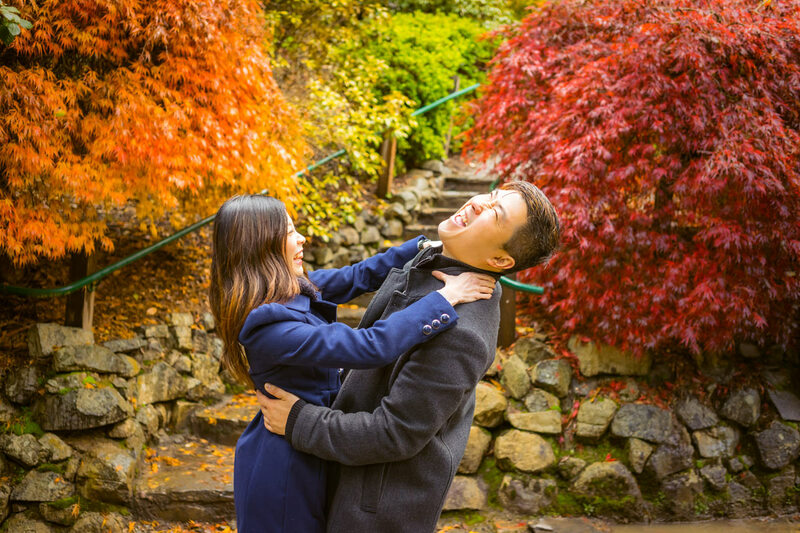 After a long year of shooting with us through every season, we were thrilled that Derby and Yu Sze were so happy with their photos that they could cherish for a lifetime. 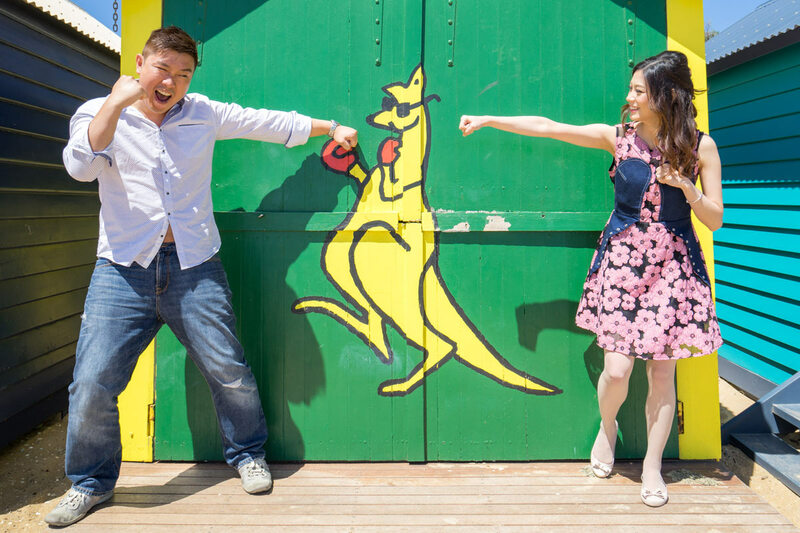 The Black Avenue Productions team will drive almost anywhere and even take overseas bookings. 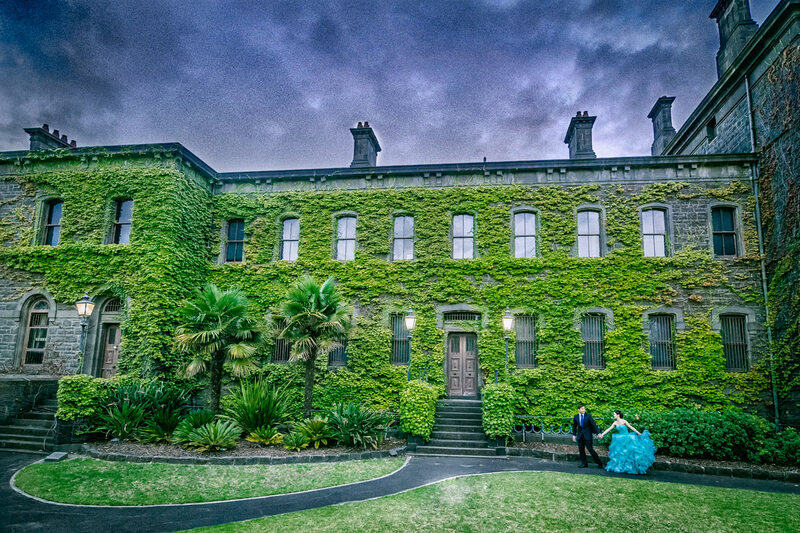 If you have big ideas for locations for the perfect wedding or pre-wedding photos, please let us know!